Scenarios ought, by any effective working definition, contain both positive and negative characteristics of a possible future: they should depict a possible real future, and in as much as reality itself contains delight, despair, and contradictions, so should a depiction of a possible future reality. Utopias and visions, on the other hand, are written and articulated to express ideal futures based on cherished values, and so should be entirely positive. Dystopias, or nightmare images, are articulated for the purpose of creating critiques of the present and the dynamic of self-defeating prophecies, spurring people tó create change. The difficulty with addressing where an image falls on this continuum is that the evaluation is completely value-based and subjective: your ideal vision may be my nightmare (as Hitler’s vision of Germany was Anne Frank’s nightmare), or merely an interesting possible scenario with disadvantages to me, or an image of the future very close to my own personal vision, but which would take considerable discussion and amendment for me to endorse wholeheartedly. 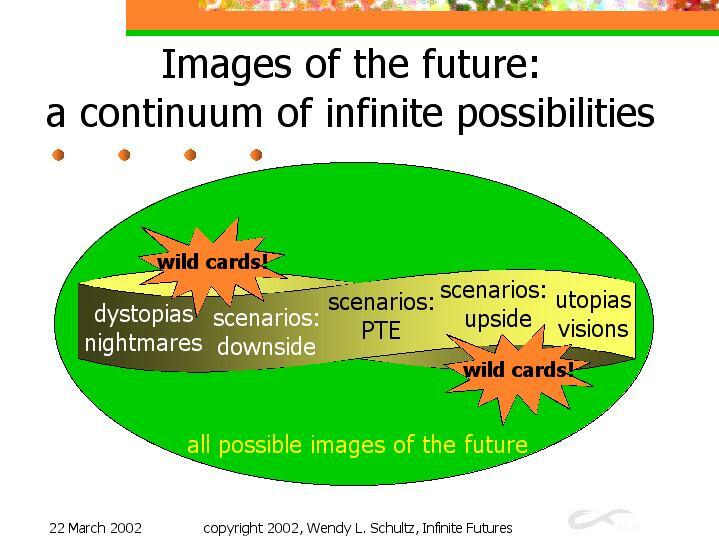 I have portrayed wild cards as explosions on the continuum located between downside scenarios and dystopias, and upside scenarios and utopias, respectively, because wild cards usually indicate a massively transformational change producing an improbable but possible future which people will either really love or completely hate.